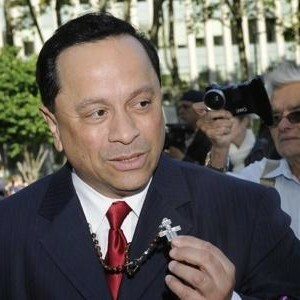 It appears that La Familia Espada is seeking to spiritually threaten and intimidate federal jurors deciding his fate. As those familiar with “Santeria” know it’s an admixture of Roman Catholicism, West African religious beliefs, voodoo and Hispanic superstitions. Santeria literally means worshiper of the saints. The “orishas” or saints are Otabala (Our Lady of Mercy), Eleggua (St. Anthony of Padua), Chango (St. Barbara), Oggun (St. Peter), Orunla (St. Francis of Assisi), Yemaya (Our Lady of Regla), and Oshun (Our Lady of Charity). 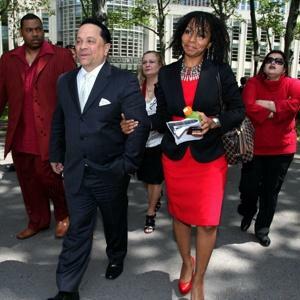 Given that Mr. Espada’s self-described “energy source” Monica Harris-Coleman (and others in the Espada entourage) wore red and black attire to federal court on Friday leads me to conclude that they are invoking Eleggua and Chango. Eleggua’s colors are red and black; red and white are said to be Chango’s sacred colors. Santeria practitioners also believe Fridays are sacred to Chango. Mondays are sacred to Eleggua. Like Mr. Espada, Eleggua is described as a trickster, mischievous and mercurial. Eleggua is also called a master magician and one whose spells are unbreakable. Chango is believed to be the most popular orisha because of his romantic and flamboyant nature. Chango also synbolizes war and dance. Did I forget to mention that Chango is malevolent? Does any of this sound familiar or brings a certain playful political imp to mind? Reporters would be wise to check the Espada trash for discarded chicken or goat sacrifices. Or rum and cigars. Lastly, I wouldn’t be surprised to see Pedro Espada decked out in red and black on Monday (Eleggua) or dressed all in white (Chango) next week. This post has been updated with descriptions of santeria practices and beliefs. Do you think former state Senator Pedro Espada, Jr. is using “santeria” to intimidate the jurors in his trial? This entry was posted in Crime, Political corruption, Poverty Pimps, Public Corruption, Religion and tagged catholic saints, chango, eleggua, monica harris-coleman, orishas, pedro espada, political corruption, santeria, voodoo. Bookmark the permalink.